“...So The VILE APPETITES of Mankind Could No Longer Corrupt The Harmony of My PERFECT BODY!" COMICS! Sometimes These Tales of Hoffman Deliver On The Fantastique But Honesty Compels Me To Admit They Are Sorely Lacking In The Opera Department! 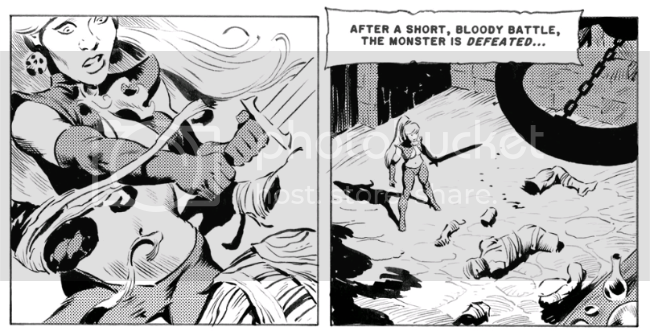 Hey, I wrote about a comic and now it's like it never existed. Maybe I just dreamt it all. That'd be spookily appropriate. Unlikely though. Anyway, this... OCTAVIA TRILOGY By Mike Hoffman Octavia created by Mike Hoffman I bought this off Comixology around Christmas time but I went looking to confirm the price etc. and now it's like it never existed. So I don't know what all that's about. It's a real thing, I swear! Octavia Trilogy is a strange little truffle of a book I disinterred during a dozy browse through the virtual shelves of Comixology in an attempt to burn up some Christmas vouchers. You may already be familiar with Mike Hoffman’s creation; I was not and I freely admit I judged this book by its cover. This is something you should never do, so I’m forever hearing, and yet that’s what covers are for. So, I don’t know, someone needs to make their mind up about this whole covers, books and judging business. 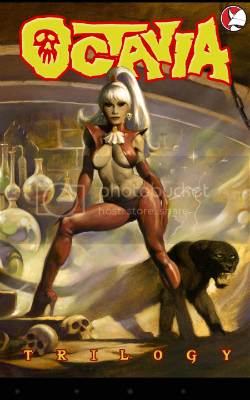 Consumer confusion aside I decided to buy Octavia Trilogy because the cover called to mind old Vampirella comics and it called them to mind so vividly I thought I’d found some kind of lost 1970s knock-off. Usually if I want to enjoy looking at some odd 1970s relic which has suffered the full brunt of posterity’s disdain then I just look in a mirror for free but as these were comics I had to splash some cash. Octavia Trilogy was definitely comics but it turned out to be somewhat less cobwebby than I thought. The first ,er, piece (story might be pushing it; see later) is from 2002 (maybe?) and then there are additional chapters that appeared at sporadic intervals thereafter. And now here they all are between two covers…(hmmmm it strikes me now that we’ll be needing a new phrase in The Future won’t we? Now every exciting byte of Octavia's adventures are in one data file! Tell you what, we’ll work on that and get back to you. ) So, yes, comics, not as old as I thought and…in my defence it’s little wonder that I pegged the book as originating some decades earlier as Octavia Trilogy is an act of homage at times so good it teeters on forgery. In it Hoffman is homaging both bad movies and good comics; 1960s Italian gothic horror and 1950s EC Comics. That makes things a bit twisty turny on the rating side as by rights they should be terrible but really well done comics. Or really terrible well done comics. See, good and bad have no real meaning when dealing with women in swimsuits who live in candle-lit castles ; it’s more about whether you enjoyed it or not. And I did enjoy it and, yes, it is about a woman in a swimsuit who lives in a candle-lit castle. Because, as I said, part of what Octavia Trilogy is homaging is Italian horror cinema of the early 1960s. Even a thickwit like me couldn’t miss it as the book opens with a sequence so in debt to Mario Bava’s Black Sunday (1960) it’s in danger of being dragged into an alley and having its knees shattered. However, Hoffman has swapped out the svelte brunette of the movie for his own visual fetish; the blonder and somewhat earthier looking Octavia. As a result it’s a lot less Black Sunday by way of Barbara Steele and a lot more Black Sunday by way of Barbara Windsor. Hopefully we’re clear that it isn’t this Black Sunday (it’s never on telly is it, that Bruce Dern one? How odd. Well, I like it.) Before the cineastes out there get all worked up I should stress that obviously Black Sunday isn’t a terrible movie but that classy homage comprises only the first few pages and after that the book flops bonelessley straight into bad horror like it has been struck from behind by an unseen hand. I don’t know if Hoffman has purposefully strained to recreate the adolescent experience of watching a badly dubbed and choppily cut horror movie on your B&W portable with the sound down low (so Mom and Dad don’t know you’re still up) or not, but I do know he has achieved that effect beautifully. (Also, your Mom and Dad knew; they always know). Things happen in Octavia Trilogy and sometimes they happen for a reason but that reason might be different to the reason that they happened a few pages ago; it’s like the book is resetting itself as it goes along to accommodate the, um, unique narrative demands Hoffman’s imagination makes upon it. Why it's almost as though someone were making it up as he went along…! To start off with Octavia’s a witch but then she’s a scientist; there’s this guy she doesn’t know but then she does know him and they have been lovers for years; there’s the tragically misunderstood and disfigured scientist who is now actually evil and has developed a Mortococcus, I guess, because he likes Jack Kirby’s Kamandi even more than I do; in the second chapter the entire first chapter is now a movie everyone was starring in but now actually it’s all a dream from which Octavia can only awaken because not answering a knock at the door is impolite and that just won’t do; and really you’re going to just have to abandon sense and cling to sensation of you’re to get anything out of Octavia Trilogy. And that’s just some of the stuff that happens never mind how all that stuff happens. 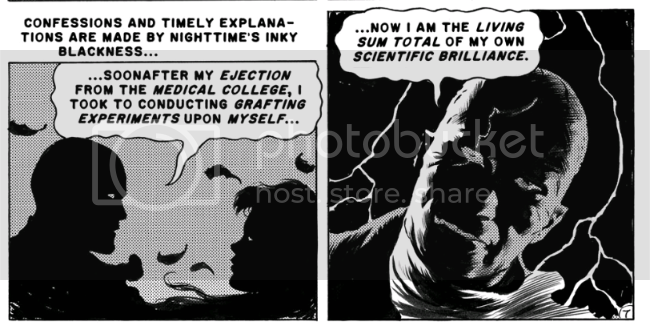 On the page it all happens in images deliberately evocative of EC horror comics. There’s a fondness for the signature EC 2x3 grid layout and even the use of Leroy lettering ,for that mechanical touch no one actually likes but which is very EC indeed. Most obviously and most immediately (despite being more Warren than EC Comics, but what you gonna do, huh.) Angelo Torres’ influence lends everything a subtly rutted texture. While there’s a certain sense of Wallace Wood in the impression of disparately sourced images unified by sheer strength of style there’s none of Wood's signature EC clutter; none of the boisterous attention to detail. As the painted cover suggests Hoffman’s emphasis is far more on Frazetta for the figure work and overall feel. 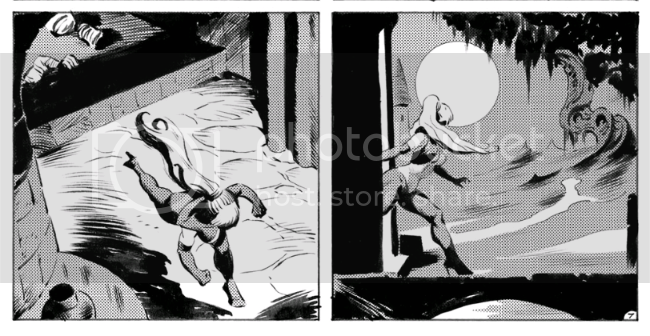 Great as all that stuff is (and it is great should your palate be so inclined) there remains the fact that the image in any panel loses focus and fades out the farther it gets from the elements which most interest the artist. Which is fair enough as Octavia Trilogy may not be a work of obsession but it is certainly a work of passionate fixations. Did I mention that those passionate fixations are ridiculous horror films and women of a fetishitically precise set of attributes. I bet I did. Because it’s important you have no illusions (except that one about there being Justice; Christ, people need something) about this book I must stress again the nature of the work you may be considering subjecting yourself to. As lovingly crafted and handsomely illustrated as it all is it remains a fact that it is all in service to a homage of hypnotically bad movies. The dialogue is stilted and random; clearly English but the kind of English that’s a bit off in a way that you can’t quite put your finger on. People say things that seem to make sense but actually don’t. Early on a guy says he’s exchanged everyone’s passport for the keys to a castle so they can use it as a location for their photo-shoot. I’m not really up on property rental but that doesn’t quite ring true. People say other things and you just wave it through but then the things they said tickle your mind a little later and you wished you’d checked their papers more closely, but they’ve probably exchanged them for the keys to a castle anyway. As you do. One guy is riddled with arrows but turns up later claiming some photographic plates he had about him(?) saved his life. Well, o-o-okay then. Oddness abounds not just in the things which happen but in the way things happen. Bizarre things occur and no one reacts with much more emotion than James Franciscus thinking about changing his bed linen. The men are all coiffed and tailored in a style that was only ever stylish in such films. They are all collar length hair, cravats, sweaters, slacks and sports cars. You know that all the parts would be played by folk with names unconvincing in the extremity of their Anglicisation (Terrence Shakespeare, Butch Drift, Spencer Bentine with a Very Special Guest Appearance by John Saxon) and their lips would lag behind the dialogue like a tipsy ventriloquist had his hand up all their bums. Basically, things in Octavia Trilogy happen in a way that suggests you keep blacking out at crucial junctures. Smarter folk than I would probably refer to dream like temporal elisions or nightmarishly jarring shifts in mise en scene . What they’d be struggling to articulate is the fact they don't know why but for some reason they like it. Oh, and don’t get carried away by Octavia being clad in her scanties as Octavia Trilogy is very much a throwback to a much coyer time. While the blurb breathily claims that “Hoffman never tires of drawing her in every imaginable position”(!) it turns out that the hypothetical imagineer in question has a very sedate imagination encompassing activities as outre as walking about, bending down and maybe a bit of jumping around for spice. At its rawest the book has some shadowed kissing and off panel amorous action it is heavily implied extends beyond merely holding hands beneath the covers. The blurb also makes reference to Octavia’s “deep dark Dungeon” and it does actually mean a deep dark dungeon but at least now everyone knows what kind of mind you have, Buster. But is it the kind of mind that can handle Octavia Trilogy; the comic that acts bad but is actually GOOD!? Has malefic Evil even been darker than on that storm torn night Nature ruptured and spat forth - COMICS!! !